Spacious with even more room and variety – all that and more add to the attraction of the Lufthansa Business Lounge in Departure Area B at Frankfurt Airport after extensive renovation. Newly reopened right on time as the holiday season gets underway, the lounge will spring a surprise on passengers at the Terminal in the shape of a very special innovation: On an area of close to 1,400 square metres, the lounge offers a first-ever "Jet Friends" lounge for children alongside the customary comfort, bistro and work areas. Besides a spacious comfort area equipped with leather armchairs and TVs, the bistro in the completely refurbished lounge serves hot and cold drinks, snacks, fruit and meals in a menu that varies with the time of day. In a separate rest room, guests can unwind and relax in peace and quiet or get some work finished in preparation for a business appointment at their destination. They can also freshen up in one of the five shower rooms in the bathroom area. The biggest Lufthansa lounge in the airline's global route network has a surprise in store for children on the move: The youngest among its clientele now have their own dedicated area to romp about in and play. 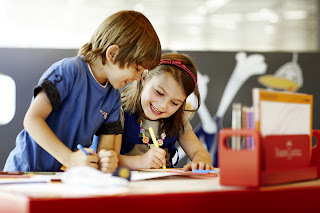 A kids' corner and playpen will keep the very young quietly occupied, while drawing tables, bean bags, a PC with Internet access and game consoles are available for the older children. For their entertainment, the lounge also has a children's cinema with comfortable leather benches. Frequent flyers can also make use of a very special offer at the start of the holiday season: Between 24 June and 31 August, they will have the chance of taking their family with them into Lufthansa Business Lounges for a fee of 40 Euros (56 AUS dollars) and make their journey that much more pleasant and relaxed. The offer is valid for spouses or partners and children up the age of 18 in all Lufthansa Business Lounges in Germany and the USA. The Lufthansa lounge world encompasses around 60 lounges, worldwide, with total floor space of more than 28,000 square metres. Depending on their booking class and customer status, Lufthansa passengers can spend time prior to their flight, unwind, freshen up or work in four different lounge types – First Class, Senator and Business lounges or the Welcome Lounge in Frankfurt. 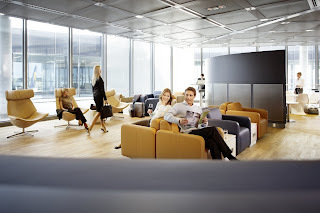 Together with more than 800 lounges made available to Lufthansa passengers by Star Alliance and cooperation partners, Lufthansa offers premium customers a lounge network that ranks among the biggest in the world. To expand and enhance that offer, the airline is investing around 150 million Euros up to 2013 in the construction of new lounges or lounge refurbishment. Currently, Lufthansa, SWISS and Austrian Airlines operate flights via 12 getaways from five origins in Australia. Within Europe, the Group's airlines fly to over 150 destinations, offering Australia traveller the most extended network of all airlines.